In the early twentieth century, vaudeville and silent film star Roscoe “Fatty” Arbuckle was at the top of his game. A predecessor and mentor to Charlie Chaplin, Buster Keaton, and Bob Hope, Arbuckle’s influence on stage and screen was palpable. It’s this influence that the Turkish cigarette brand Murad hoped to capitalize on when they hired Arbuckle to promote their product in print in 1905. So what’s changed in the last decade? Well, marketing firms are tapping into a new (and less expensive) type of celebrity: the Social Media Influencer. These are individuals who have built a robust following online—we’re talking millions of devoted followers—but don’t come with a Tom Cruise price tag. If they’re carrying a Coach clutch, or wearing a certain watch, or drinking a new kombucha, their followers take notice, translating to direct sales for the brand behind the curtain. Don’t Skip the Vet. Vetting influencers before hiring them to promote your brand is paramount. More critical than a candidate’s follower count is assessing the quality of their photography and social media copy. Are they truly engaging? Do you “buy” whatever it is they’re selling? Is their brand messaging on target? And, most importantly, does your product align with their character, their brand, and their followers? For our campaign, we specifically sought out a mix of male and female influencers on the east coast, all of whom had a passion for fashion and travel. When they donned their Boca Terry robe by the hotel pool and boasted about its comfort, it felt genuine. Curate the Content. Communicate the message and the goals of your campaign to your influencers. They are your brand ambassadors, and as such, they will need all the tools and information available to promote your brand accurately and effectively. 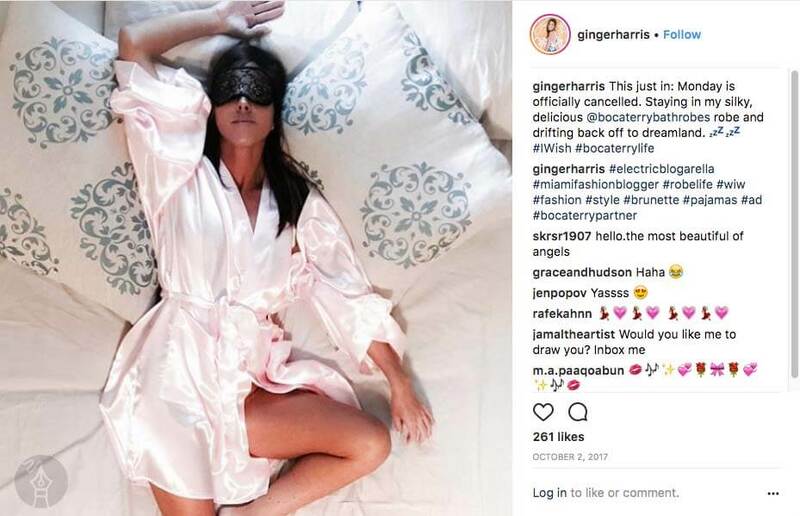 We provided each of our influencers with one of four bathrobes, two customized, trackable links and a hashtag (#BocaTerryLife) to incorporate into their posts, and some central points that pertained to the message of this particular campaign. Report, Repost, Repeat. While our influencers were posting on Facebook, Twitter, Instagram, and their blogs, Brand Poets did not sit idly by. We created a thorough report about each post (including images, copy, and initial reactions), reposted all of the content on Boca Terry’s Instagram page, and occasionally included the influencers’ blog posts in Boca Terry’s monthly e-newsletters. Remember: One of our primary goals in this campaign was to increase brand awareness; sharing the content on multiple channels was essential. Know Which Metrics Matter Most. Assuming you’ve tracked everything responsibly, a social media influencer campaign will give you a whole sea of useful data, particularly if your ambassadors are posting on numerous platforms. Your objective now? Sort through all the numbers to determine what matters most. How will you adjust your marketing strategy? Will the metrics change how you position your brand moving forward? Which products shined, and which ones failed to deliver? These are tough, invaluable lessons that can shape, improve, and inform the way you do business. Is a social media influencer campaign the right move for every brand? Of course not. But it’s also imprudent to dismiss their impact or to claim that their influence is limited to handbags and sodas. In some markets, these internet trendsetters are outperforming television commercials, radio ads, and print ads in terms of direct sales. So, if these social media influencers deserve anything after this impressive initial run, it’s our close attention.